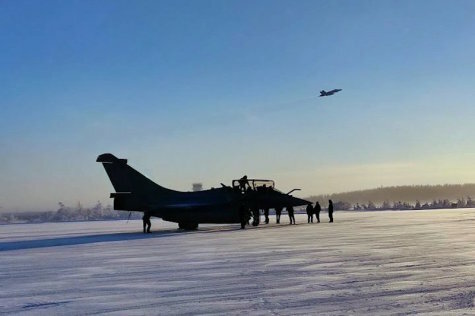 The French defence and aerospace company Dassault Aviation has deployed a Rafale multi-role fighter to Rovaniemi Air Base for a cold weather testing event on Monday 28th January. Scheduled for the coldest time of the winter in Lapland, the testing event lasts for approximately one week. The tests measure the fighter’s performance in sub-zero temperatures. The cold weather testing event includes engine run-up tests and taxiing on the flight line. However, also a few flights may be included. Lapland Air Command hosts Dassault Aviation’s cold weather testing event at Rovaniemi Air Base. However, no Finnish Air Force flight operations will be associated with the tests. Carried out by the French defence and aerospace company, the testing event is not a part of the HX fighter programme, designed to find the replacement for Finnish Air Force’s current F/A-18 fleet.